ASKA town in Ganjam district resembled a water world on Friday. ASKA/CHIKITI: Aska town in Ganjam district resembled a water world on Friday. The whole town was submerged under 11 feet water as Badanadi and Rushikulya rivers wreaked havoc in the region in the aftermath of cyclone Titli. The very severe cyclone dumped unprecedented rains on the district causing the rivers to swell and rampage through the towns and villages throwing lives into the throes of absolute misery. 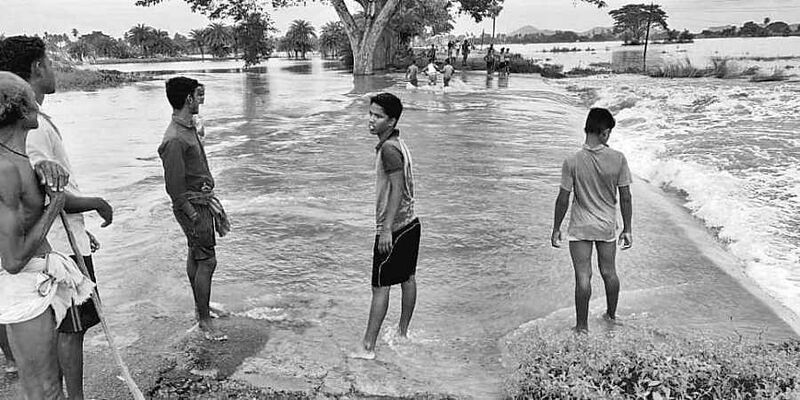 The brunt of Titli notwithstanding, the people of the sugar town, as it is popularly known, are now left battling a more serious crisis of floods whose severity matches the 1990 flood that originated from Machilipatnam in neighbouring Andhra Pradesh. People were seen perched on roofs and cramped in the top floors of buildings as the entire town went under water in a span of 12 hours. The ground floor of 69-year-old T Raja Rao’s house at the Main Road area under water, his family of three has shifted to the first floor. His late father R Adinarayan had lost his grocery shop and godown, to the 1990 floods. After years of struggle and a number of loans, they had managed to revive their business a few years back and now, the family owns four more shops in addition to the grocery shop and godown. Now the family has to begin from scratch again. “The only silver lining is that I have got all my shops and the godown insured this time but seeing the extent of flooding and damage of property all-around, the town will certainly need years to recover,” said Raja Rao. The flooding, however, has sparked fury among the locals who accused the administration of slackness in anticipating the situation and taking preventive measures. The officials were prepared for a cyclonic storm but not floods, Amulya Upadhyaya, Sarpanch of Bhetnoi said even as locals staged a dharna. “When Government had announced time and again about the impending cyclone and floods, no steps were taken to prevent the flood water from entering Aska. The authorities in charge of reservoirs and irrigation canals should have opened gates on time for discharge of rainwater but that was not done”, he alleged. Chikiti block, like Aska, has also been marooned by flood waters of Bahuda and Bogi rivers. Many villages under the block are under three feet water and in darkness. Power supply, that was snapped on October 10, is yet to be restored. “It is a real case of water everywhere but not a sip to drink. People have been provided with relief but they are struggling for drinking water,” said Sarat Panda of Tanhar village under Chikiti block. ‘While most of the villagers stocked food and other essential commodities, they did not stock drinking water as they did not expect such severe flooding,” he said, urging the local administration to come to the rescue of villagers.